Ganesh Chaturthi or Vinayakar Chavithi is less than a week now I'm sure most of you celebrating this wonderful festival must be already thinking what to make for Naivedyam from Chaturthi to Visarjan day it's a tough task I agree. So make your job easy and check out collection of recipes including sweet, savory, Naivedyam recipes, rice, sundal and many more for your easy planing. I have mention in my last year Ganesh Chaturthi posts that in my parents home Vinayak Chaurthi was never celebrated but that doesn't mean I missed all the fun though I still miss is bringing home those colorful Ganesh Idols and in Chennai they always comes with a Umbrella. I still wonder what can be reason for those tiny and cute umbrella with Ganeshji would be, if you know the answer do share with me. 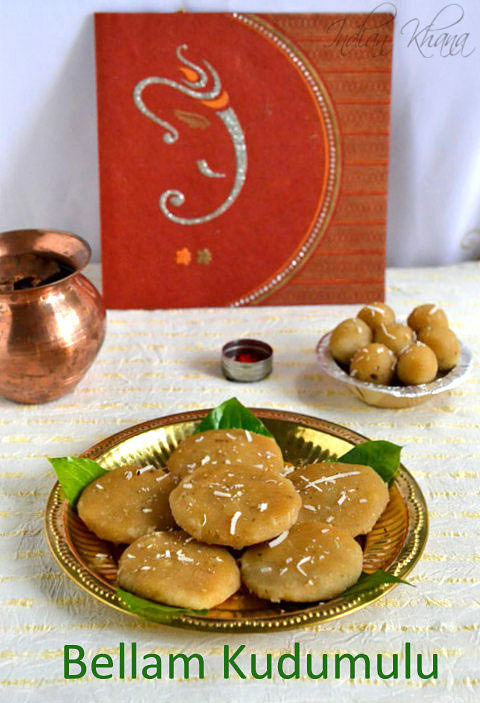 Today I am posting Andhra popular Ganesha Chaturthi Naivedyam recipe Bellam (Sweet) Kudumulu and in Tamil it's known as Vella (Sweet) Ammini Kozhukattai or even as Mani Kozhukattai only the shape differs in both the version rest of procedure is almost same perhaps in some home there might be little different procedure but the basic idea is as describe below. 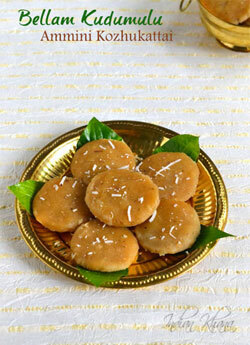 Kudumulu or Ammini Kozhukattai is made of simple ingredients like rice flour, jaggery, coconut and cardamom. It's very easy to prepare and we doesn't have to worry much about shaping them like modak so this recipe is good for the people whom have difficulty with modak shaping. 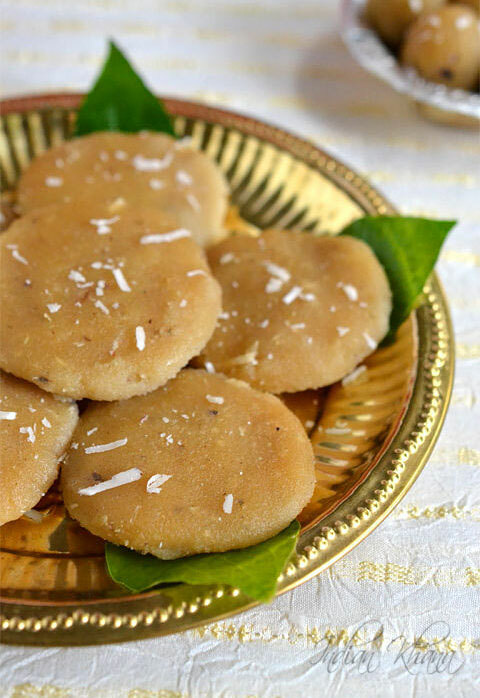 You can still have your Naivedyam ready with this simple recipe. 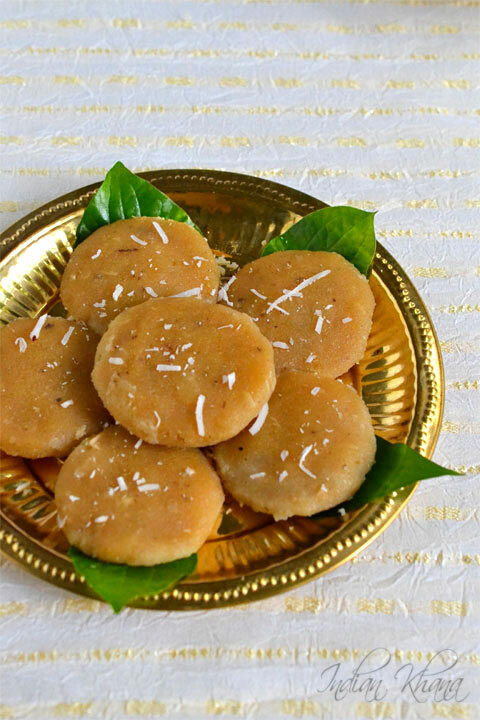 Other than this sweet version we can also prepare savory version of ammini kozhukattai which served along as Naivedyam too and it's also works as snack. 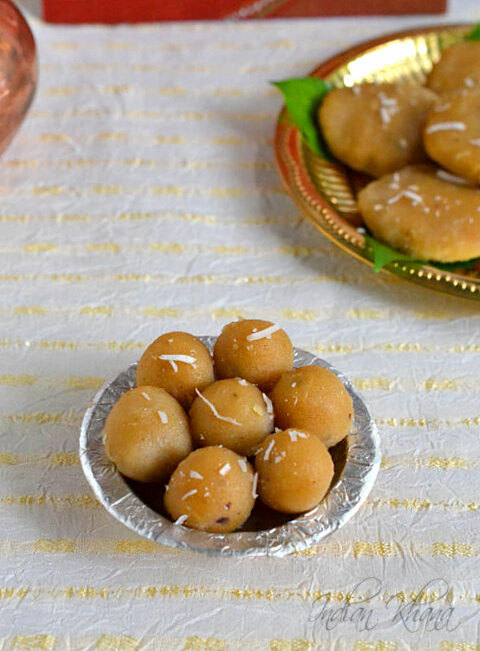 Other traditional Ganesha Chaturthi recipes you can check Ragi Inippu Pidi Kozhukattai, Rajma Modak, Ukdiche Modak, Dates Sesame Laddu, for full list of recipes collection click here. 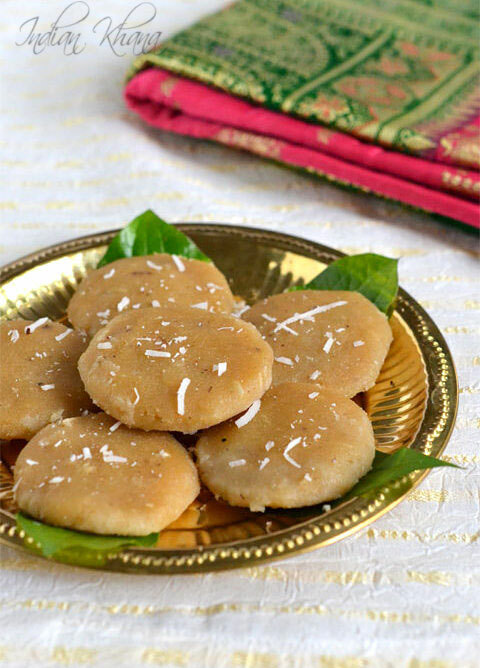 Bellam Kudumulu also known as Undrallu or Vella Ammini Kozhukattai is Naivedyam recipe made during Ganesh Chaturthi. Roast rice flour for 2 minute or until fragrant in a pan or wok and keep aside. 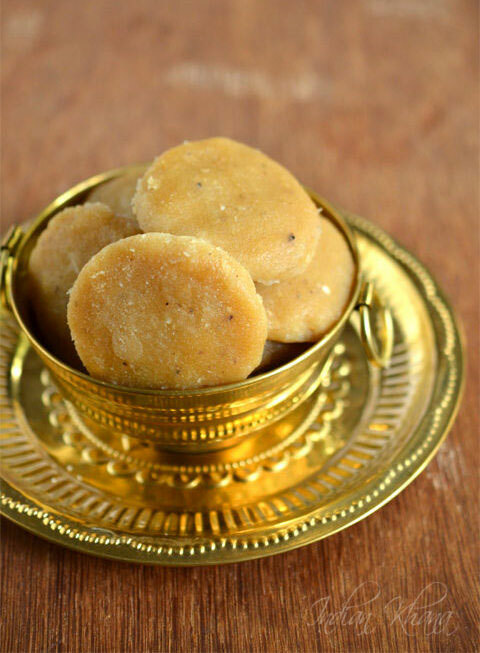 In the same pan bring water to boil and add jaggery, allow jaggery to melt and boil for 2 minutes. Add cardamom powder, coconut and give a stir. Slowly rice flour, keep mixing to avoid any lumps of forming, slowly dough will start to form and it will be little soft than regular roti dough. (don't be worried initially when you see dough will be runny in few seconds it will start to form shape) Dough is ready when it forms a mass and doesn't stick on side of pan. Off flame, cover and keep aside for 5-10 minutes for dough to cool. Add 2 tsp of ghee or oil for vegan version and knead to form smooth dough around for a minute or two. Grease had with oil or ghee and divide dough into equal portion. For kudumulu make a small lemon size ball and flatten it between palms. For Ammini Kozhukattai pinch small lemon size or little of dough and roll in to smooth balls, repeat same for rest of dough. Prepare a steamer or heat water in idli cooker, grease a steamer plate or lay wet cloth, arrange kulumbu/kozhukattai in it and brush it with oil/ghee, steam for 10-12 minutes on high to medium flame. 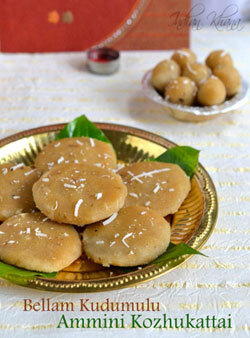 Serve as Naivedyam and relish these yummy kudumulu.